The information on this site is transmitted to you via electronic means, and therefore it may contain errors, inaccuracies, and defects it is the user’s duty to verify the information presented on the site. The production is not responsible for the correctness of the information and/or for any action or damage or alteration or cancellation caused, including in respect of changes in dates and/or sites and/or places. In any case of damage caused as a result of canceling and/or changing the details of the event the production is not responsible for refunding the customer and the client will have no claim against the production. The system does not allow selecting places and saving seats. At the time of booking, you will be required to fill out a form, including details as name, ID number, telephone number, e-mail address, credit card details and order details. You are not required by law to provide such details and providing them only depends on your wish. However, if you do not provide all of the requested information you will not be able to make the purchase. The Production shall act to the best of its ability to preserve the information and shall make no use thereof except for the purposes specified in the terms of this Agreement. Submitting false information knowingly may cost you a criminal offense. Fraudulent applicants may take legal action, including tort claims for damages caused by production and/or anyone acting on its behalf, due to disruption of the sale process. The Production reserves the right to cancel an order due to the submission of false, partial or inaccurate information. Payment for the purchase of the tickets is made by credit card. When booking, the customer will be charged the full cost of the reservation. Approval of the transaction by the credit card company through which the customer undertook to execute the purchase constitutes an early and necessary precondition for accepting the customer’s offer to execute the transaction. Upon completion of the booking process, your order will be confirmed by the e-mail that you submitted After making the reservation. Upon completion of the transaction, after the customer has confirmed the order details, the system will display a confirmation containing all of the details of your order with a notice that the transaction has been completed successfully. The production site provides safe and secure purchase by the credit card companies, and the company operates the best and most sophisticated systems in order to secure the information received on the site, providing complete protection of the consumer’s details and credit card details in order to prevent the prohibited use of information And the payment system. The production reserves the right to change prices at any given time. The appearance of tickets on the site does not constitute a confirmation of availability. Only final confirmation of the order made by the site will constitute final confirmation of the order. The Production shall do its best to use the means at its disposal to preserve the confidentiality of the details of the Buyers and to prevent them from reaching foreign entities. Since this involves performing activities in an online environment, the production can not guarantee absolute immunity from penetration into its computers or the disclosure of stored information. If, despite the security measures taken by the Production, a third party will be able to penetrate the information, including information collected about or misused by purchasers, you shall have no claim or demand against the Production. The personal information you provide at the time of booking will be kept in the production databases. The production reserves the right to collect information about your purchasing habits, needs, products purchased, information or reading, the pages you viewed, the products and services that interested you, the means of payment used by you and any other information. The production will not transfer your details to a third party (as far as these details identify you), except in the following cases: a. Transferring your information to suppliers for the purpose of supplying the products and/or services sold. B. If you have committed an act or omission that harm or may harm production or any third parties. c. If you used the production services to commit an illegal act or to facilitate or encourage the performance of such an act. D. If you violated the terms of this Agreement or any other agreement with the Production or anyone acting on its behalf. e. If the production has received a judicial order instructing it to give your details to a third party. f. Any dispute, claim, demand or legal proceedings, if any, between you and the Production. If the production merges or organizes its activities within the framework of another corporation, it will be entitled to transfer to that corporation a copy of the information that has been collected about you, provided that such corporation accepts the provisions of these privacy clauses. The production may use the personal information you provided at the time of the order and any information that will be stored about you when using the site for the purpose of producing and analyzing statistical information. The production will be entitled to provide statistical and other data to third parties, provided that the data does not relate to you personally or identify you personally. The information presented on the production site is for information only and is not suitable to serve as a valid reference for any matter and for any proceeding under any law. The production and/or its shareholders and/or its managers will not be responsible for any direct or indirect damage, financial or otherwise, caused to you as a result of using and/or relying on the services on the site or on the information and contents appearing therein. All copyrights and intellectual property in the design of the production site and in any software, application, computer code, graphic file, text and any other material contained therein – are of the production only. The trademarks on the Site are the property of the production only – or, if published on behalf of advertisers, are the property of these advertisers only. Using them without their consent (of the production and/or advertisers) in writing and in advance is a violation of law. 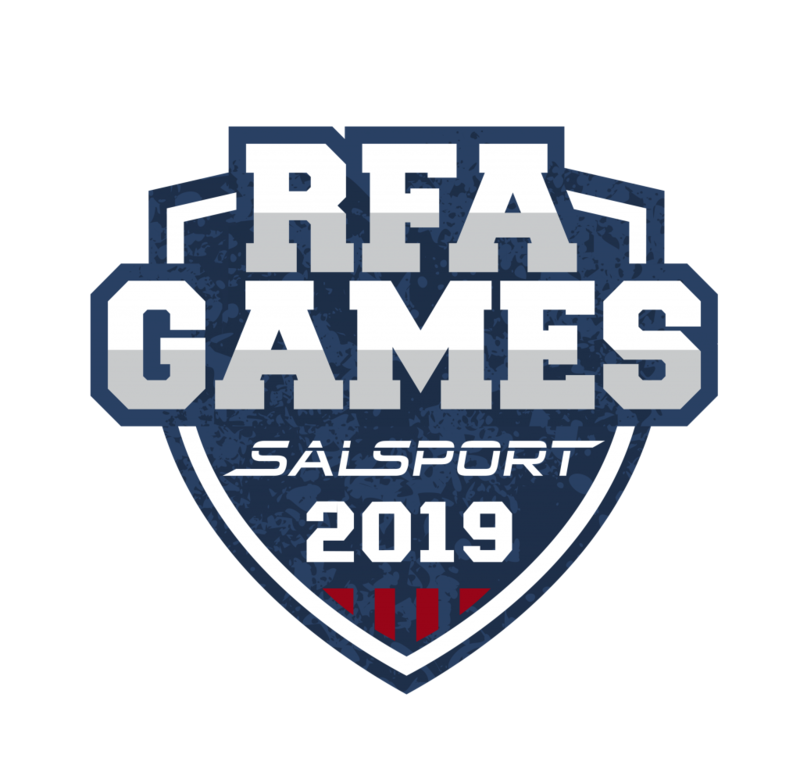 Participation in the “RFA GAMES” competition will be permitted to the 196 athletes who have reached the highest international rating in our filtration system, as published in the Medias and on the competition website. Top athletes will receive an organized message and they will be invited to the reception day – will be published below. Signing a health declaration and transferring the approval to the production company is a mandatory. Each athlete participating in the competition is required to submit to the production a medical certificate form signed by a doctor with a valid license, a health declaration form and a competing information form on the day of the reception. this constitutes a basic condition for participation. Each participant will be asked to sign a form that allows the production to use the photos of the athlete being made during the competition days. This form constitutes a condition for participation. Registration fees for athletes will be paid by credit crad (the athletes will be notified of the payment and the due time). The registration fee includes the participant’s insurance cover. An athlete who does not complete this fee will not be able to participate in the competition. Each competitor receives one free ticket. All participants must be cooperative, mature and highly self-disciplined. The instructions of the judges, the volunteers and the production team must be obeyed and the rules of appearance and timetables as detailed in these regulations must be observed. The athletes who were invited to the competition after the preliminary stage will receive a comprehensive briefing from the production representatives on the day of absorption. Participation in the briefing is mandatory. In the framework of the briefing, the athletes will be presented with timetables for the competition, dates, dress procedures and behavior during the competition days. For the benefit of the athletes there will be a training room and sterile athletes complex (transition will only be allowed to the competition team and athletes and will require a personal badge). An athlete who registered, received clothing and chose not to participate will be required to return the clothing or alternatively be charged a fee of 750 NIS. The athletes must meet the timetables that will be defined and will be published on the schedule board. An athlete who does not appear in time (over 5 minutes late) will be disqualified. The promotion will only be allowed in the designated sports clothing, which the athletes will receive pre the event. An athlete is not allowed to confront judges about the judge’s decisions. In exceptional cases, the result can be appealed by means of a special form submitted to the Audit Committee. The committee’s decision is unequivocal, and the athlete must respect it. An athlete who does not accept the decision of the committee and/or will confront judges whether physically or literally will be removed from the competition. The athletes must exercise extreme caution at each step of the competition and act according to the accepted sports rules, while maintaining the personal health and health of the other participants. An athlete who does not behave according to the rules and acts negligently, which endangers him or the other competitors, will be removed from the competition. The entrance to the sports fair in the courtyard of the arena is free and is conditional upon the approval of the Israel Police. According to the decision of the Israel Police, the production will be able to close the gates and prevent the entrance of an audience beyond the area.The entrance to the Hall to watch the competition, the performance and the ceremonies is for ticket purchasers only. The MAX amount of audience inside the hall is 3,000 people, the number of places inside and the number of tickets. The entrance to the Hall is on the basis of an available space only and it is not possible to obtain marked seating. The entrance to the Hall is conditioned to the presentation of a valid Entry Ticket (including the relevant day’s appendix – Thursday, Friday or combined). The card will have a track record that will be scanned at the entrance to the hall. Each card can be scanned only once. Then the card holder will wear an identification bracelet. Without a bracelet it will not be possible to go up and sit in the stands. Keep the bracelet and do not remove it! Entry tickets for the event are for two days! The loss of a ticket and/or a ticket that has already been scanned will not receive any compensation whatsoever! a person who will lose the bracelet could not enter the arena. The card grants the right to board and seating only. Entrance to the grounds is subject to security checks. The entry of weapons of any kind is forbidden to the area of the event. There is no place for storing weapons. Animals are forbidden to enter the fairground area.There is no entry with alcohol to the area of the competition. peddling is not allowed. It is forbidden to smoke in the Hall throughout the games. A person who practices verbal and/or physical violence will be removed from the competition and will not be entitled to any refund! Every person who goes to the stands needs a ticket (from the age of 3). The instructions given by the security guards, the police and the ushers, must be obeyed, as well as the production team. It is forbidden to enter areas that are marked as off limits. It is absolutely forbidden to go down to the athletes area. It is absolutely forbidden to cross fences other than through the marked passages/stairs. A number of badges are assigned to different functionaries. The badge is personal and can not be transferred! There are points where it will be necessary to identify the name of the owner of the badge for granting passage (the athletes compound/communication complex, etc.). The tags that are issued at the event are: Production Tag – Free passing at all areas, Sports – Sports Complex, Exhibits – to the exhibitors at the Sports Fair, press – the sports area with the approval of the production and entrance to the VIP area. Exhibitors at the Sports Fair will be placed in accordance with the number of the booth they have ordered, and without exceeding the area. It is prohibited to remove merchandise/furniture/equipment outside the area of the rented pavilion. It is forbidden to operate loudspeakers in the sports fair grounds. Every owner of the pavilion must maintain cleanliness in the area of the pavilion and remove garbage from the pavilion at the end of the day. Alcohol (beer) will be sold in an orderly bar only. Selling will be to those over the age of 18 only. No person shall purchase alcohol for anyone who is not over the age of 18 in the area of the competition. Entrance to the VIP area will be permitted only to persons over the age of 18. It is forbidden to bring glass bottles into the area of the Sports Fair and the Hall! It is forbidden to insert glass glasses into the stands. Food will be sold at the Fairgrounds, both through fast food stands and through the fairgrounds. The sale of food in the field will be permitted only after the approval of the Ministry of Health has been submitted for production. It is absolutely forbidden to use gas for heating/cooking purposes in the area of the event. It is absolutely forbidden to set fire in the area of the event. A stall/exhibitor who sells food without the production permit and the approval of the Ministry of Health is expected to be immediately removed from the place. A stall/exhibitor that sells food will maintain a proper display that maintains the quality, freshness and cleanliness of the food being sold. The seller displays food will use gloves. A food seller/exhibitor will ensure cleanliness of the area throughout the entire duration of the event. It is absolutely forbidden to sell raw meat, fish, sushi in the area of the event! It is strictly forbidden to sell/serve non-kosher food (seafood, pork). Food sellers will make sure to use clean dishes as a priority for disposable dishes. It is forbidden to sell/serve food other than the one approved in advance by the production. The sale on the site will begin immediately upon the site’s launch. Purchase through the website is by credit card only.Child / Soldier Card – An ID will be required when the card is scanned. Without an ID, no entrance to the Hall will be permitted. Cancellation of a purchase after execution of the transaction -(A) If the consumer cancels the purchase agreement, the dealer may charge the customer a cancellation fee at the rate of 5% of the price of the goods or of the service value or NIS 100, whichever is lower. (B) Where the transaction was conducted by credit card and the dealer to the consumer proves that the credit card company or another entity with which the dealer has entered into credit card clearing has collected payment for clearing the credit card in the canceled transaction, the dealer may also charge the consumer with the payment collected from him. The ticket provides entrance to the inner hall area (stalls) and seating rights only. There are no marked places and seating is subject to availability.